There are so many interesting kids books in the world that our contributors don’t often double up on a title — but in this case, they did. 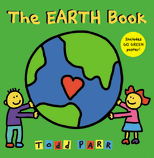 First, read Jennifer’s review of The Earth Book by Todd Parr. Then keep on reading for a different take from Carolyn. Todd Parr does it again! Many of you are familiar with the author/illustrator’s books– they are simple, cheerful and humorous while encouraging us to enjoy each other and embrace our diversity and each other’s quirks. In The Earth Book, colorful, fun illustrations and a light tone take children on an upbeat journey through steps we take to help our planet. I have enjoyed Mr. Parr’s other books, and was happy to have an opportunity to read and review this one. We really liked this book in particular because it illustrates how people incorporate simple ways to help the planet into their everyday lives. The Earth Book also explains the rationale behind taking these steps in a joyful, child-friendly way (“I take the school bus and ride my bike because…I love the stars and I want the air to be clear so I can see them sparkle.”). As always with Todd Parr’s books, his vivid illustrations evoke happy spirits. This is a fabulous book for children and adults who love color, bring a joyful heart to being mindful about lessening our impacts on the earth and want to dig into a story that will support them as they continue on that path. As a bonus, the cover of the book turns into a poster entitled “10 Ways I Can Help the Earth.” Our favorites are number four (be nice to worms) and number ten (put my underwear in the freezer when its hot). I recommend this book for everyone. Still, through my rose-colored lenses, I see the fragmented thoughts as opportunities to discuss such matters at some length and challenge kids to make these important connections on their own (or with a little help). The tear out poster lists 10 ways kids can help the earth, including sharing books — and as Jennifer has noted, being nice to worms and oddly enough freezing underwear when it’s hot outside. Check out Todd Parr’s website for other fun, kindhearted titles as well as The Earth Book coloring pages.